Business - Doing business in apparel in the border market seems to be a promising undertaking in Papua. This phenomenon is seen from the number of clothing merchants in the market Skow, Muara Tani, Jayapura. Marketing Point Coordinator, Skow market manager, Ahmad bin S.M, said the Skow market is generally dominated by grocer, clothing, electronics and building materials. Specialized clothing merchant, Ahmad said the number reached 100 people. The number is fairly large considering Skow marketers only reach 163 traders. "The number of apparel traders is indeed dominant," said Ahmad Abah, greeting familiar, to republika.co.id, via telephone connection, Monday (27/6). Data released by Marketing Point in May 2011 recorded that market turnover in May may reach RP. 4,447 billion. Of these, Rp. 2 billion donated apparel. Followed groceries, eletronic, building materials and glassware. Ahmad said, especially the big day like Christmas and Easter, the turnover of apparel went up significantly. On the big day the market turnover rose 200 to 300 percent. 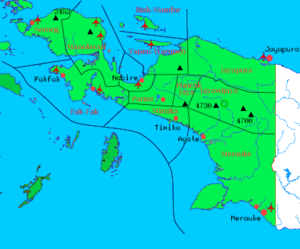 According to him, significant increases will often occur if the Indonesia-PNG border is opened every day. So far, PNG has only opened borders on Tuesdays, Thursdays and Saturdays for cross-border shopping. Because of its great potential, Ahmad said the Indonesian government needs to lobby the PNG government to allow the border to be opened every day. Thus, according to Ahmad, the effect is enormous on Skow's market turnover, primarily apparel business. "I think many illegal crossers who violate the rules, PNG would not want to consider the possibility," he said. It is said Ahmad, the dominance of clothing traders can not be separated from the required capital is not too large than the seller of electronic groceries let alone. According to him, one clothing man needs a capital of Rp 30-75 million. While every day, the turnover of clothing traders at least Rp 10 million. "They (PNG citizens) once bought a lot, 70 percent for private wear, while 30 percent for resale," said Ahmad. The types of clothing sold vary widely. Starting from children's clothing to adults. Even when Justien Bieber fever, clothes that there is a picture of a Canadian teen singer is selling well. "Make no mistake, the market here knows the trend as well," he said as he shrugged. In addition to selling apparel, the Skow market also tucked batik clothes. However, unlike apparel, batik has not been so in demand. However, there are buyers from PNG who buy batik. Interestingly, there is a kind of competition between Javanese batik and Batik Papua. Ahmad said, Papuan batik less popular than Javanese batik. "Batik Papua less behavior, precisely batik from Java are in demand," he said. In addition to the different styles, Ahmad said, Java batik prices more affordable. For one Papuan batik, buyers have to spend up to Rp. 150-200 thousand. While the origin of Java batik dibanderol only Rp. 50-70 thousand rupiah. "So, Papuan batik is more expensive 300 percent of Javanese batik," he said. The high price of batik Papua, according to Ahmad, can not be separated from the process of making. Average batik from Papua is home-made with a process that takes quite time consuming. Not to mention, the materials used must be imported first from Makasar or Java. Ahmad said most of the apparel supply comes from Tanah Abang, Jakarta. Besides Tanah Abang, Skow Market apparel supply is taken from Bandung and Surabaya. Although the distance is very far, according to him, the price of clothing Tanah Abang with apparel from Bandung and Surabaya is quite competitive. For example, T-shirts from Tanah Abang cost Rp 10 thousand, then the price in Papua reaches Rp 30 thousand. The difference in apparel prices from Jakarta with the prices of Bandung and Surabaya is not much different. "It could be, either Surabaya or Bandung, the supply from Tanah Abang as well," he said.